I wish I could tell you I have been in a scrapbooking rut. Why else would I not be posting any layouts? I have not been in a scrapbooking rut. I just have not been following through and posting them after I am done. I’m still making messes, finding strips of paper in the sofa, and unearthing ‘old’ photos and papers to rediscover. I’m having a blast. My mom took this picture of our dog Piper this past May. Piper is 13 years old now so we let her get away with everything. She is slowing down but she surprises us when she takes off like a bullet after Cobi. She does whatever she wants, which usually means ignoring me and paying attention to Price. She is just about always happy, except when she gets shots from the vet. She greets you at the dog and practcally climbs up your leg to be held. If you stop rubbing her she will nudge you to start again. Pipes knows when you need some cuddling and some extra love. 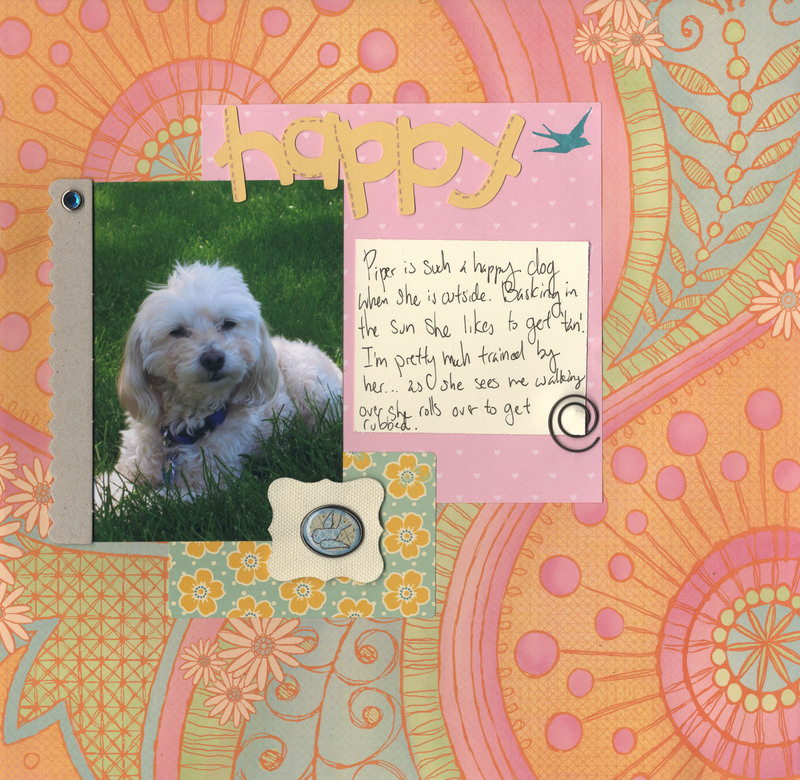 Filed Under: Scrapbooking and Crafts Tagged With: dogs, Piper, Scrapbooking and Crafts, Stampin' Up! wow, hard to believe that Piper is 13. Gave her a bath today, total spa treatment…she was loving it. Piper is looking foward to Price being here next week, she told me. Next week, Piper will ignore me, she just loves Price !!! looking forward to Boston this weekend !